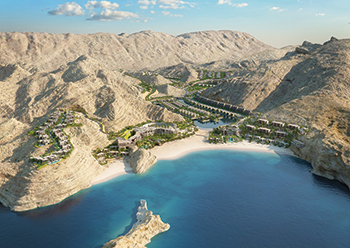 Saraya Bandar Jissah, the developer of Oman’s newest integrated tourism complex (ITC), has awarded two major contracts for construction of its Wajd and Nameer residential zones to Towell Construction and Company (TCC). A part of WJ Towell & Company, TCC is a leading construction company with major operations across the sultanate. TCC was also awarded the contract for the construction of Zaha – the first residential zone launched by Saraya Bandar Jissah last year. The awarding of the contract comes after a competitive tender process and subsequent negotiation, marking the next development phase post the awarding of the infrastructure, residential zone Zaha, the two hotels and the staff accommodation buildings, said Sheikh Hamood bin Sultan Al Hosni, the chief executive of Saraya Bandar Jissah, after signing deal with Hussain Jawad, the chairman and managing director of TCC. The first of the two zones, Nameer, is set on the beachfront with close proximity to the two five-star hotels where it benefits from sea views and the surrounding lagoon. The residential zone consists of a mixture of three- and four-bedroom villas, he stated. “The residents will experience tranquillity and luxury as all villas are positioned on an island with gardens running down to the crystal blue waters of the beautifully-sculptured lagoon. These spacious properties with large outdoor areas are finished off with an infinity pool, giving residents full benefit of the zone’s captivating view,” explained Sheikh Hamood. Wajd, on the other hand, is located on the highest developed point with panoramic views, and these exclusive villas are expected to become one of the most sought-after addresses in the region. With 22 villas in this residential zone, residents will have close access to the hotel’s facilities and five-star service, said the top official. “Wajd’s signature villas are the ultimate in lifestyle and luxury epitomising the true haven Saraya Bandar Jissah is. The two zones are part of Phase One of the development and are due for completion by 2017,” he added. “The zones Nameer and Wajd are envisioned to be some of the most picturesque and state-of-the-art properties in the project and amongst other ITC properties in the country and so the association is paramount,” Jawad stated. Saraya Bandar Jissah, which is being developed in partnership between Omran and Saraya Oman, is located on the outskirts of Muscat on a secluded beach surrounded by the Hajar Mountains. The project is being built on 2.2 million sq m of land with an expansive beachfront and a high point of 250 m above sea level. It will be home to 398 exclusive residential units, spacious hilltop villas, stylish town-houses and luxury apartments – all with attractive waterfront and mountainside views.